It's a normal weekday for most but for me I’m ecstatic and woke up with this excitement I can't contain, I go outside to take a deep breath of the glorious morning it is and sip on my ritual cup of coffee as I thank God for a new day. I’m normally the first to wake up in our house, actually I’m always the first one up, Coco my wife and Amo my little sister love a little extra sleep. This particular morning its no different (sorry for the exposure ladies). My mother is visiting around this particular time of the year and she is second to rise. She is particularly excited this morning as she walks into the kitchen in her pj's. My wife is the next one up and she has also got an unusual smile that is always a beautiful sight. Our house is happy and excited for the day ahead. This is generally the energy in our home but today we are cooking and hosting Hugh Masekela! We have been planning this day for weeks now. Menu is planned, wine is stocked, and music is playing loudly as the anticipation of having the legendary Hugh Masekela arriving later on in the evening sets in. What a privilege that day was and all the other special times I got to spend with the most iconic man I have ever met. This wasn’t the first time I had met him though. No, that moment was way less special and matter of fact pretty average. We were invited to the City Press offices for a shoot and an interview early on in our career. At the very same shoot was the man himself, Hugh Masekela. I could see Mo-T was extremely excited being a horn player and all, but I must be honest for me it was special but not a life changing moment. We exchanged greetings and that was it. But allow me to share with you the second meeting i had with Bra Hugh and how that, to this day remains the greatest moment of my musical career. I am a proud ambassador of Mercedes Benz and one day a request came in from Selvin Govender, who is one of the coolest dudes I know in the corporate scene. 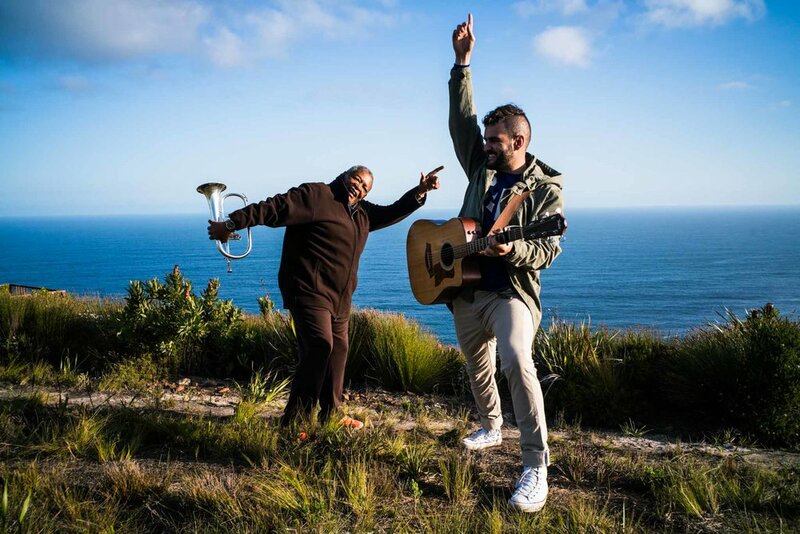 “J I want to do this video with you and Hugh Masekela where I place the both of you in a car and you have to come up with a song in 48 hours.” I thought it was random and at the same time really cool but again I will be 100% honest here ... I didn’t think it would be what it became. We arrived in the Tsitsikama forest with a large film crew and the scenery was just jaw dropping. On our bus ride there Bra Hugh is already sharing so many stories with me. I am throwing so many questions at him. Trying to soak up as much as I can. What followed that week was a time in my life I can't quite explain. The man was Godsent. He was unlike anybody I had ever met. He was so willing to impart. He was so willing to share wisdom. He was so unashamed about all the things he had experienced and was so proud of his story. Most of his stories were honestly unbelievable! That Hollywood life, he lived it and a little more! From stories about him and Michael Jackson’s parents, to Louie Armstrong, Marvin Gaye, Fella Kuti, Miriam Makeba (which by the way is one of the most incredible love stories of all time in my opinion), to all the other “babes” and great shows and written off cars, and money that was too much to count. This guy lived life to its fullest. This you all know. This I’m sure you’ve heard of specially in these last couple of days where everybody has been reflecting on the great legacy he left behind and also the AMAZING person he was. Hugh was amazing. But I want to share with you something very personal and honestly life changing for me. A gift I received from Bra Hugh that I will never forget and forever hold onto. I was in awe of this story as he carried on sharing other stories about their good times in Hillbrow and specially Yeoville. As the days went by I drove Bra Hugh around in the Merc as every day he had new stories that seemed to never end. I was a sponge. Eager to listen. Eager to learn. Living in the moment that was unfolding before my eyes. As each day passed I began to realize that this wasn’t just another thing in my life, I was doing something so incredible that most people would dream of. I was sitting next to the most iconic man I had ever met. I was sitting next to one of the most influential jazz musicians in the world, I was sitting next to a man that would change my life with his next words. I wrote Heaven in You in 5minutes. After I think day 2 I went into my room late that night, got my guitar out and I kid you not the words just flowed out of my mouth, almost supernaturally. I was so excited as I ran out of my room and knocked on Bra Hugh's room who was staying right next to me. I told him, “Ive got the song! I want you to listen to it. Its all about you! I hope you like it.” I began to play the song and second verse in Bra Hugh starts to shed a tear. I couldn’t stop smiling as a finished the song for him. When I finished there was this silence and what followed next is to this day the most special day of my musical career. The pride I felt in my heart was like that of a little kid when he hears his father say how proud he is. I couldn’t sleep that night. I was making a song with Hugh Masekela. I wrote a song about Hugh Masekela. To top all of that off, he loved it! Why is this special for me? Well I guess you can answer that on your own, but what added a lot of meaning for me is that I make music because I love music. I make music because it makes me feel purpose filled. I was so worried I wouldn’t match up to all the legends Bra Hugh had worked with (completely normal to feel this way given the list of people he worked with). But no J, wake up its real ... he loved the song! He didn’t only love the song, he thought you were one of the most unique musicians he had ever met. ME?? Bra Hugh, missing you and thankful to God for allowing me the moments He did with you.